The Kirk Cousins sweepstakes is quickly heating up. Earlier today, ESPN’s Adam Schefter reported (via Twitter) that there were four “final” teams vying for the quarterback’s services: the Broncos, Cardinals, Jets and Vikings. 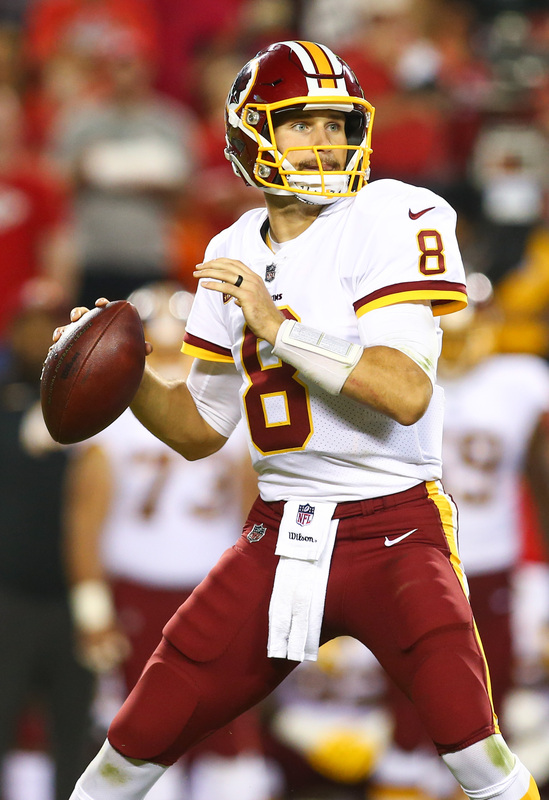 Denver, Minnesota, and New York have definitively been connected to Cousins for much of the offseason, but it’s mostly been speculation surrounding Arizona’s interest in the signal-caller. Following the retirement of Carson Palmer, the Cardinals currently aren’t rostering a single quarterback. With the return of David Johnson and the presence of Larry Fitzgerald, Cousins would seemingly have an opportunity to flourish in Arizona. In a bit of an ironic twist, Cousins posted a picture of himself and Fitzgerald on Instagram yesterday, writing “Ran into Fitz in the airport yesterday. He’s a GREAT recruiter!” Unfortunately for the Cardinals, they’re currently operating with less cap space than the other three candidates. Assuming these are indeed the final four teams vying for Cousins, the report seemingly takes several other potential suitors out of the mix. Primarily, the Browns, who are armed with $110MM-plus in cap space, seem to be out of the race for the quarterback. NE is gonna have Brady for maybe 3 more years, same if not less for Big Ben in PIT. Jacksonville is a good team but for now they’re being held back by Bortles who’s coming back next year. NFC has Philly, potentially Dallas if they can bounce back, Green Bay, Minnesota, SF and LA on the rise and pretty much the entire South outside of TB. I would take the top 3 in the AFC over the top 3 in the NFC for the next 3 years. You can go ahead and deduct Dallas and San Fran from that list. San Fran has proven nothing other than a late season win streak that will be long forgotten next season and Dallas is Dallas, they will mess everything up as they seem to always do. How about the Titans? They are a yound and talented team “on the rise”. The Texans with Watt and Watson? The Chargers young defense. Then there is another young team in Oakland/ Las Vegas with a new coach. The AFC has the worst bottom dwellers in the NFL but they have the best teams for the next three years. Minnesota has never won a ring and absolutely wouldn’t with Cousins at QB. The fact this guy will soon be the highest paid qb in the league (likely) is a joke. I get it won’t last long but I still don’t see what he has done comparatively to other QBs to deserve the money. ….but then again I sure never saw nick foles winning a ring so there’s a reason I have nothing to do with evaluating players. Kind of like Jimmy Garappollo being the highest paid player.. I’m a Vikings fan and this idea scares the crap out of me. Yeah he’s good but for 30 million or more??? That’s nuts. I think he’s going to be a Viking but personally not high on him. Lol why do the cardinals always go for old qbs? This is the year they need to draft one if they can. He’s not even a top 10 quarterback and is going to be probably highest paid quarterback is a joke. While I agree with your statement, the supply and demand of good QB’s is low on supply and high on demand. Cousins is good enough to take an already good team like Denver or Minnesota deep in the playoffs. The Jets would have to overpay just for him to consider them considering he had options that are playoff ready. Rodgers will wait t to sign until Cousins does just to get more $$ than Cousins. Life long Vikings fan and I don’t want cousins for more than 20 million. Any more is ridiculous and will hammer our team. Only QBs that will sign for that low is teddy and Sammy. Cousins and case will both demand more. I think that Cousins will have pressure if he chooses Minnesota over Denver. Denver’s record was 5-11 last year and could have been 10-6 or 11-5 with Cousins due to all of the pick 6’s that were given by our current QBs and West was won with a 10-6 record. Minnesota last year was 13-3 and in the NFC championship game last year and all of the pressure will be on Cousins if they don’t win the SuperBowl with him at QB anything less and it’s on him and the coaches. That’s why I feel that he will choose Denver over Minnesota because he wants a chance to get to the SuperBowl without all the pressure that Minnesota will demand.